"There are threats to American democracy in 2014 that you have probably heard about.. For instance, any day now the U.S. Supreme Court is expected to blow up another big category of federal election law, ending contribution limits to non-candidate political committees. It’s such a foregone conclusion that analysts have even published lists of the newest political players with ready checkbooks. "And then there’s the death by smaller cuts to democracy that don’t get noticed beyond the election wonk websites or by voters until Election Day when they throw up their hands and wonder what is going on? 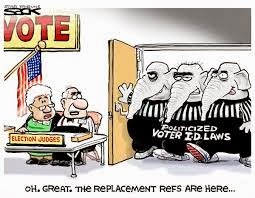 While there are efforts in 2014 to make voting easier—such as five states setting up online voter registration and a congressional effort to fix part of the Voting Rights Act that was gutted last year by the Supreme Court, many Republicans are working to make voting harder and slower. "This year is shaping up to be another season where the GOP’s game plan is to reshape the electorate and election rules to retain their power; instead of bringing all eligible voters into the process, running on the strength of their ideas, and trusting voters’ decisions. What follows are eight aggressive GOP attacks on democracy. It’s not a compete list. "1. 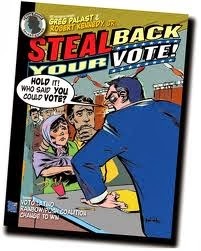 The Latest Voter Suppression Catalog: North Carolina. "Until the Republicans took control of the governor’s mansion and Legislature in 2012, North Carolina pioneered some of the most progressive election laws in the South. Since then, the GOP has resurrected the ghost of Jim Crow, narrowing options to register, to vote early, and to obtain a ballot on Election Day. Bill Moyers noted these abuses in a detailed report this month, but even he didn’t recite everything that’s gotten worse. 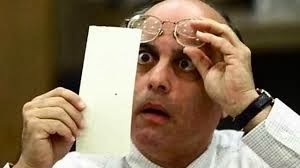 "North Carolina’s GOP has also ended straight party voting in 2014, where a voter can pick all of a party’s candidates. Its governor won’t fill a vacant U.S. House seat held by a Democrat until November, instead of holding a traditional special election. The last time the state’s elections were this rigged was more than a century ago, legal scholars said. "2. And Now Early Voting Is Un-American, GOP Hacks Argue. 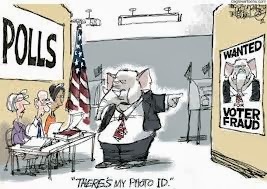 "In recent elections, much of the GOP’s focus has been on enacting tougher voter ID laws so presumed Democrats would have a harder time and give up on voting. But it’s turned out that many targeted voting blocks—people of color, students, the poor, some elderly—figured out how to get required IDs and voted early, especially in the states offering that option. Now, the new twist among Republican intellectuals is arguing that voting early is bad for the democratic process, because candidates can’t control their end-of-campaign messaging and voters won’t benefit from last-minute debates. This is anti-democratic propaganda at its worst, as there is ample documentation that voters not only prefer convenient options, but early voting raises turnout in lower-profile contests. "3. Proof of Citizenship on Paper, Not By Sworn Oath. "Not everyone has their birth certificate or passport. That fact is being manipulated by Republicans in a growing number of states—Arizona, Kansas and now Georgia—to create yet another barrier for getting on voter rolls: documented proof of citizenship. Until a few years ago when Arizona added this new proof to its registration forms, would-be voters—like everywhere in the country—would sign a legal oath, under criminal penalty, that their information including U.S. citizenship was correct. That declaration wasn’t good enough for Arizona’s GOP, which has been fighting in federal court to add paper proof to the federal registration form. "The issue went to the U.S. Supreme Court, which ruled it was up to an obscure agency, the U.S. Election Assistance Commission, to figure it out. 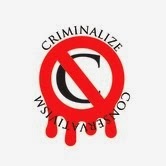 That body has no sitting commissioners, as Congress and the White House have let it languish. But weeks ago, its legal staff told these three Republican-run states to back off. 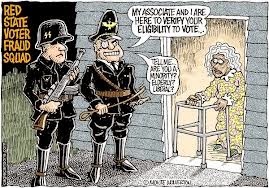 Now a full-on legal fight is brewing with giant consequences, because if these Republicans are successful, many eligible citizens won’t be able to register to vote by just signing a legal oath. "4. Their Newest Immigration Reform: Let Millions Stay But Not Vote. "Republicans know that they are a party of older, mostly white and wealthier Americans in a country where that demographic is becoming a minority. So taking their citizenship fixation a step further, the latest idea to emerge among House Republican on immigration reform is to let the 11 million undocumented Latinos to legally stay in the U.S., but only allow children born here—so-called Dreamers—apply for citizenship. That twisted logic allows them to try to claim the GOP is not an anti-immigrant party, but what they’re not saying in public is that legal second-class status sustains their electoral edge in states like Arizona and Texas. It’s another version of gerrymandering—drawing district lines to ensure that one party has the majority. The Senate-passed immigration reform bill postpones citizenship for a dozen years—which is bad enough. "5. Tinker With The Electoral College To Grab GOP Votes. 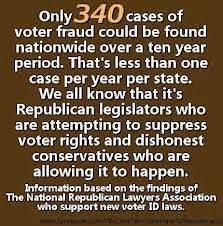 "You’ve probably heard about Pennsylvania’s crummy voter ID law that was thrown out by a state judge but has been appealed by GOP Gov. Tom Corbett. But you may not have heard that a Koch brothers-backed non-profit is trying to reallocate the presidential swing state’s 20 Electoral College votes so that it is no longer a winner-take-all system, but split between whoever wins in each of the state’s 18 congressional districts with two votes for the state’s popular vote winner. It would bump up GOP Electoral College votes. "Meanwhile, in Nebraska, which awards its five electoral votes by congressional district—with Obama winning one vote in Omaha in 2008 but none in 2012, the GOP-controlled Legislature is trying to make it a winner-take-all state for 2016. Obviously, all of this is about making it harder in 2016 for a Democrat to be elected to the White House. "6. Make Sure Top State Election Referees Have A GOP Bias. "There’s even more evidence that the GOP is willing to do whatever it takes to change the rules to win. The Associated Press just reported that a new Republican Super PAC plans to funnel at least $10 million into 2014 secretary of state races in eight states. Some of these states have seen bitter partisan fights in recent years over voter suppression tactics, where their top election official—the secretary of state—is supposed to be a non-partisan referee: Arkansas, Arizona, Colorado, Iowa, Kansas, Michigan, New Mexico and Ohio. Not to be outdone, the Washington Post reported this week that Democrats will form their super PAC to target these races in Ohio, Colorado, Iowa and Nevada. "7. Making Sure That Campaign Finance Crimes Do Pay. Another recent democracy-killing trend has been campaigns underwritten by hundreds of millions of dollars from donors whose names have been hidden by political consultants such as Karl Rove. Rove pioneered the use of using non-profit charities, which do not have to disclose donors’ names, as political front groups. Campaign finance activists filed legal complaints at the Federal Election Commission, where, in 2012, the legal staff concluded that Rove’s operation was illegal. But the FEC, with three Democratic and three Republicans, deadlocked. Since then, it has let Rove off the hook— refusing to enforce federal campaign finance law—which essentially validated Rove’s ruse. "Meanwhile, in other campaign finance-crime-does-pay news, two Koch-related groups that were fined $15 million for their 2012 political money laundering still haven’t paid up. These developments mean that 2014’s campaigns are going to be more mud-fests, where the wealthiest donors will feel free to dominate the airwaves and stifle debate. "8. Choose From This Menu Of Dirty Tactics In Your State. "With this backdrop, it’s no wonder that Republicans in various states are picking from a menu of anti-democratic tactics as they look to the fall’s elections and 2016. In Missouri, Republicans are seeking to change their state Constitution to pave the way for a tougher voter ID law. In Tennessee, the GOP blocked a bill that would let university students use any state-issued ID to get a ballot, such as a college ID. That prompted media to note that in Tennessee you can vote with a state gun license but not a state-issued college ID. "And in Wisconsin, judge issued a secret ruling in a grand jury-like investigation that may allow new torrents of anonymous cash pour into the state, apparently saying, according to news reports that as long as the funds don’t go to a candidate’s campaign that the donors can remain anonymous. The ruling was leaked to the Wall Street Journal editorial board from pro-Republican groups under investigation for secretly buying ads that supported Gov. Scott Walker and other Republican legislators during a special recall election. "The Big Picture With Voting in 2014. 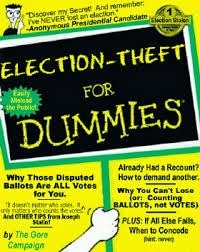 "There are many reasons why America has one of the lowest voter turnout rates for any western democracy nation. Unlike Australia, voting is not compulsory. Unlike Canada, lists of eligible voters are not created by local election officials and followed up with government-run registration drives. In the U.S., a range of state and federal agencies—from military recruiters to state motor vehicle and welfare agencies—are supposed to offer citizens who walk through their doors the chance to register to vote. But many agencies don’t see that role as their mission and don’t, such as welfare agencies. According to voting rights groups, this is also an issue with Obamacare, as the government isn’t asking millions of applicants if they also want to register. "In late January, a bipartisan presidential commission headed by the top campaign lawyers from Obama’s and Mitt Romney’s 2012 campaigns issued a report on how to make voting smoother. They purposely did not discuss voter ID, but made lots of suggestions about how to cut time waiting in line and how to make the process more accurate, cost-effective and easier. They also highlighted that the last time America replaced voting machines en masse was a decade ago and that generation of computers was getting rickety. However, they said there was a lack of newer technologies on the market. "What that means is after all the effort that will be required by some Americans to register and to vote in 2014, there’s ample reason to be concerned that not every vote will be counted accurately, especially when all-electronic machines offer no means of verifying what voters are choosing on their touch screens." We've seen that Conservatives are past masters at voter intimidation, voter suppression, the dumping of ballots, and voter machine fixing, but what other magic tricks will the Conservatives pull out of their hats this year - and in 2016? Demographics may not matter if we give the GOP control of the electoral process again. Remember, what was once one of our most important freedoms, the right of everyone's vote to be counted, was shot down by our own Supreme Court when they performed the infamous judicial coup de etat in 2000. Should anyone of those "justices" still be around when Conservatism is finally outlawed, they will have to pay the piper for their seditious actions - perhaps even the "supreme penalty." earn ultimately goes to the people. Where do you think it goes? Whose pockets? GOP presidential candidate Mitt Romney. In addition, the Koch-funded American Legislative Exchange Council (ALEC) agreed in September 2007 on a Resolution Opposing National Popular Vote Legislation. Every vote, everywhere, would be politically relevant and equal in presidential elections. No more distorting and divisive red and blue state maps pre-determining the outcome. There would no longer be a handful of 'battleground' states where voters and policies are more important than those of the voters in 80% of the states that now are just 'spectators' and ignored after the conventions. When the bill is enacted by states with a majority of the electoral votes– enough electoral votes to elect a President (270 of 538), all the Electoral College votes from the enacting states would be awarded to the presidential candidate who receives the most popular votes in all 50 states and DC. The bill has passed 32 state legislative chambers in 21 rural, small, medium, and large states with 243 electoral votes. The bill has been enacted by 10 jurisdictions with 136 electoral votes – 50.4% of the 270 necessary to go into effect.